Already in ancient times women removed unwanted hair, for instance, by using honey or razor. For centuries, smooth, well-groomed body without the unwanted hair has remained an unchangeable canon of beauty. Currently, hair removal is much more pleasant. There is also a bigger choice of the treatments and products dedicated for hair removal. Nevertheless, their effect is short-lived and the problem of too rapid regrowth returns. Permanent removal of unwanted hair is a dream for many women. 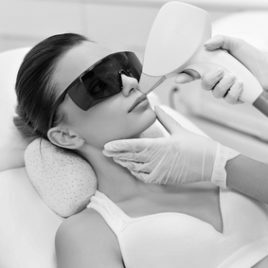 Fortunately, intensive development of aesthetic dermatology presents an irreplaceable weapon in the fight against unnecessary hair – laser treatment, which is the most effective method of permanent hair removal. Thanks to the modern technology, skin irritation and hair regrowth will now be just an unpleasant memory. Achieving and maintaining a smooth skin effect will no longer require frequent and not very pleasant treatments. QuickLight® Laser Hair Removal is a revolutionary method of totally painless and permanent hair removal. Compared to the older solutions, the laser is up to ten times faster, which reduces treatment’s time by half.